Have you experience to drink alcohol/beer until drunk? For personal safety, Drink Sensibly Application (DS Apps) is developed to help you to calculate your alcohol intake. Besides, there are several functions which may help you to call a cab/ call your DS Angel (the one may send you to home safety) when you're drunk. You may grab a FREE T-Shirt by just download the DS Apps. In additions, you may upload a photo with DS Tee Shirt to your Facebook timeline and REMEMBER to tag @drinksensibly and include the hashtag #beaDSangel. 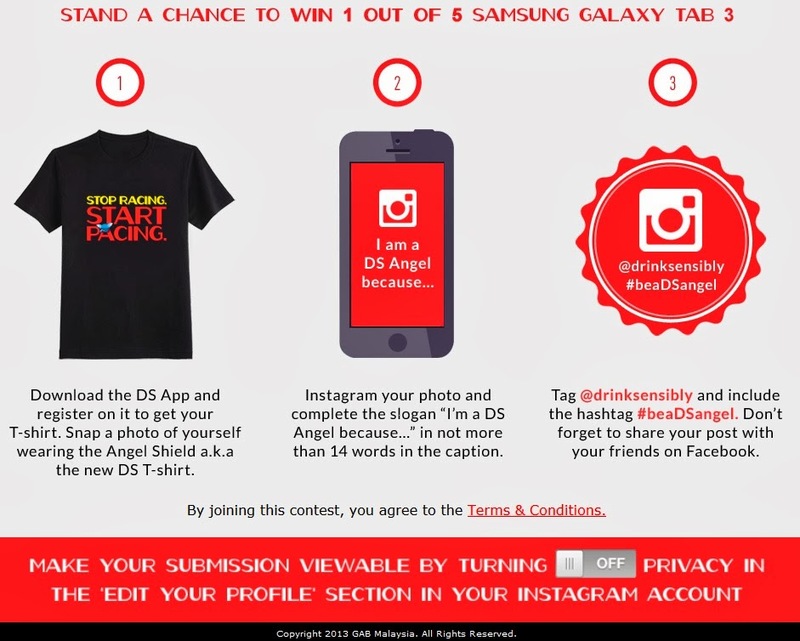 You will stand a chance to win 1 OUT of 5 Samsung Galaxy Tab 3. Personally, I had downloaded this application and I found this apps is quite USEFUL !!! So, my dear friends..... What are you waiting for ?? Make your move now !!! !